This installment of the series on soldering processes for IGBTs , we focus on the direct-bond copper substrate level of the stack-up. 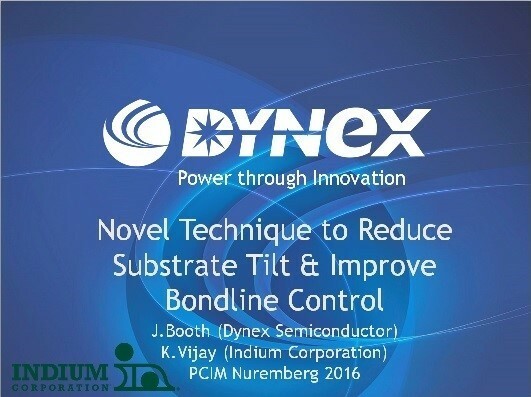 This substrate can have multiple die attached to it, making the solder bond critical. This level comes with its own specific challenges so that performance and reliability are preserved. Similar to the challenge of bottom termination components, the DBC is prone to voiding. Many of these substrates are +45mm in the x and y. To ensure the best result, many assemblers opt for a fluxless vacuum reflow solution in a reducing atmosphere to achieve the lowest void result. However, even in this case solder quality can adversely affect the voiding. Alloy purity and constituent percentages are very important as well. In cases where a fluxless vacuum reflow is not available, a flux may be needed. This is tricky due to the fact that volatiles can also add to the voiding. It is for this reason a highly engineered flux coating is the best option. Given the larger component, liquidus solder will be unable to support the component weight evenly during the reflow process. This can result in an uneven bondline which will create areas of increased stress during cycling. In order to prevent this, Indium Corporation has developed the InFORM®. This is a reinforced solder preform which preserves the bondline co-planarity and adds lateral strength to the joint, increasing reliability in the process.